well, you MUST stay at the DRURY INN HOTEL!! we stayed at the one on IH35 north! :) wow! that is such an AWESOME PLACE TO GO noooooo kidding! and very reasonable for what you pay!! check THIS OUT! BREAKFAST everyday!! and it is HOT! you have scramble eggs, sausage patties, biscuits, gravy 4 different cereals, 3 different juice, fountain drinks, coffee, milk, fresh fruit, different bagels, breads, donuts, toast, freshly made waffles!!!!! AWESOME!!! SNACK TIME....EVERYDAY! from 3pm to 10 pm....FREE FOUNTAIN DRINKS AND COFFEE! yep, all you can drink and FREE HOT POPCORN!! yeah! you KNOW i love popcorn!! AND it is all night long and it is AWESOME for a snack! and did i forget to mention HAPPY HOUR?!?!?! from 5:30pm to 7pm, every paying adult for every room gets THREE free acoholic drinks (full selection) AND they serve a BUFFET for everyone!! they have such things as, egg rolls, baked potatoes, chili, hot dogs, hot wings, chips, nachos, etc!!! AND that is on top of the snack time going on!! YUMMY!!! as their slogan says, some say SNACK some say dinner!! :) we said dinner a couple of times!! hey FREE FOOD right? anyway, they had a NICE pool and their rooms are CLEAN!!!! :) and the eating/beverage area is VERY family friendly with 2 different tv's on and PLENTY of seating!! that hotel is usually hoping! but it is SOOOOO NICE!! the boys are loving the pool! alex has gotten REALLY good and more confident in the water! we keep him in his life vest the whole time with no problem! he now can actually dog paddle around the pool and just have fun! he is getting good enough to swim away from us and keep afloat! he LOVES IT!! matthew is LOVING the pool too! he does tons of excercises there in the pool! he also loves his little float! we actually bought it for alex when he was an infant but since he was such a small fry, he never fit in it! matthew fits PERFECT! he LOVES it!! he loves to splash and to put his face in the water! we have to watch him because he will snort water up or drink it! stinker! matthew had a rough night last night here at the hotel. we are messing with his feeding schedule trying to get him off his night feeds because he is really RETCHING in the AM....last night, i don't know if he is coming down with something or what but he had alot of nasal drip which caused him to cough thru the night which then caused him to retch REPEATEDLY thru the night! no kidding! i must have got up at LEAST 10 times with him going thru this! poor baby! i just pray that maybe it was just last night and not a cold or something! his sats were fine though so we shall see and keep an eye on him! i just REALLY realized how on edge i am...by that i mean, that i have this ritual EACH AND EVERY NIGHT, even when my wonderful hubby says he will do it....here is my ritual. we give the boys a bath and i take over matthew and james takes over alex. he puts alex to bed and says prayer and cuddles with him. with matthew, he already KNOWS that when i put him on our bed, it is time for his inhaler and OOOOOHHHH how he just LOVES that inhaler. i feel sorry for our neighbors because he just SCREAMS and cries and turns BLUE because he is holding his breath! anyway, after all that drama (and YES anonymous, i STILL have drama in mylife!) i then conect him to his g-tube extension and put him bed. i give him hugs, kisses and prayers and then i sit for a BIT and get ready. then at 9pm, i start getting his meds ready. he takes FOUR meds at night. 2 of them i have to mix with water and draw them into the syringes (zonegram and the valium) and the other 2 i just draw from the bottles into the syringes. then i administer the doses and soon after, he falls asleep (probably the drugs). then i connect his pulse ox on his toe and then to the machine (can't do that BEFORE because he LOVES to pull on it!) then i sit and watch him and his pulse ox and just LISTEN for anything unusual in his crib. his heart rate has been REALLY dropping recently (in the 40's) and i have been thinking that maybe i need to mention this to the drs..his sats are great thougH! then at 10pm i set up his feeds and get him started. he now has been INCREASED on his night feeds from 600 a night to 730cc and an increase in rate from 75cc/hr to 90cc/hr...he is not tolerating them to well so thru out the night i have to jump up when i hear him gaggin or coughing so he doesn't reflux!! and then the wierdest thing is that when i FINALLY decide it is ok to change into my jammies i have to put my clothes in a NEAT pile by the doorway JUST IN CASE SOMETHING HAPPENS! yep, it feels like i am just always at the ready to GO!! anyway, these are just thoughts that i go thru someday. it is hard to believe that we do this on a daily basis.. and this is only the night time routine...NO ONE KNOWS what we go thru........i just wish i could do sooooooooo much MORE for both boys! and can you IMAGINE, matthew is probably on the VERY LOW scale of kiddos that have special needs!! i can only imagine others parents that have so much MORE they have to do for their babies than we do!! i pray for them....AS ALWAYS we always COUNT OUR BLESSINGS!!! THANK YOU GOD! ANOTHER awesome train!! we went on the BERTRAM FLYER and the boys were SOOOO EXCITED!! (and so was mom!) it was an HOUR train ride one way and then it turned around at bertram and came back! during the ride, we just saw the countryside and just enjoyed the ride. alex got up a couple of times to walk on the moving train!! it was kinda warm though for matthew but he did great! we had to wet him down a bit to keep him cool! but man, it was a BLAST!! alex was soooooooo excited and on the train ride back, he fell asleep!! sooooo cute! the rythm of the train caused ALOT of people to fall asleep! daddy included! anyway, we bought him a engineer hat and a shirt that says "future engineer" on it for his birthday and matthew got a shirt too! we are thinking of buying some tickets for THOMAS TRAIN RIDE here is austin! he is actually coming and will pull the train for a 30 min ride and sir topmhat will be there too!! :) we just have to decide if we take the chance because the tickets are already on sale and the event isn't until nov 2!!! that is right in the heart of SICK SEASON for matthew........we will have to act FAST because they have already sold over 4 thousand tickets for this 3 day event!! take the chance or not....?!?!?!?! anyway, we have had a BLAST here seeing james!! it has been such a GREAT TIME just being with him! the boys are little FISH! we went swimming here 2 times and the boys LOVED IT! 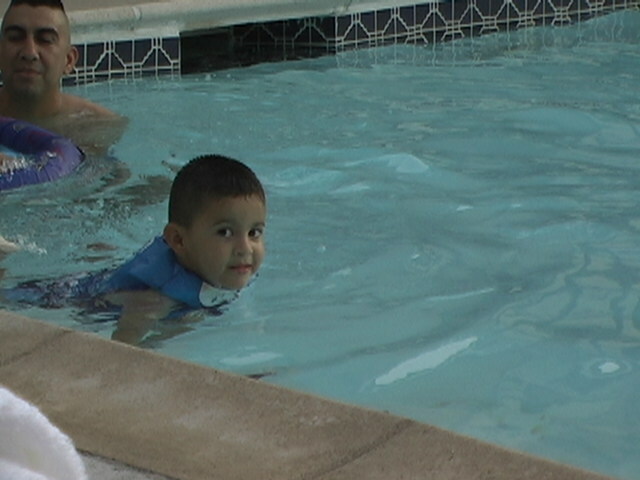 matthew always had a his "lip" going when we had to take him out! we have this ring that has a double ring and mesh in between and he had a BLAST in that! and he kicked and did tons of excercises in it! and alex did an AWESOME job by getting a bit braver in the water on his own! he had his lifevest and at first, he would not let go but now, he DOES!!! :) and kicks and swims! we also went to CABELAS OUTDOORS and that is an AWESOME PLACE! i am not much of an fisher/hunter person but i LOVE going there!!! there is sooooooooo much to see.....VERY NICE! the boys are getting sad because it is almost time to return home again. :( but we are planing to come back on wed afternoon for a couple more days and then come back on friday when daddy comes back...YIPPEEE!! and i am leaving some stuff here so that i don't have to take it back with me when i leave!! soooooo, now alex and daddy are going to go swimming while matthew takes a small nap (I HOPE!) he might throw a fit cause daddy and brother are going swimming and he is NOT!! but it is TOOOOOOO HOT for him to be out there at noontime!! 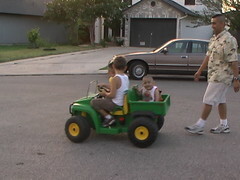 i took my 2 neices and nephew and they seemed to have fun! and then my neice got stung by a bee....they were EVERYWHERE!!! we were CONSTANTLY running and jumping...didn't get to enjoy our AWESOME lunch!! but she is doing fine!...poor little one! anyway, matthew is working REALLY HARD at crawling...he looks sooooo cute when he pulls himself up to a crawl position..he is even taking INDEPENDENT MOVES with his arms and knees!! althought he tends not to get tooo far but he is FINALLY REALLY ALMOST THERE!! i am sooooooo excited and PROUD! we have had TONS of appts this week....a total of 6 appts on top of therapies....kinda hectic but it is making the week go by QUICK!! alex has done SOOOOOO WELL. today, i took hip to matthews appts and he did SOOO AWESOME! such a BIG BOY! he still HIDES underneath the chairs but he is down there singing and talking....funny boy! far soooooooooooo good!! last night was the 2ND dose of DIAZAPAM 1mg that he has taken and he has NOT HAD A SEIZURE and HE DID NOT NEED OXYGEN!!! :)))))) that makes me SOOOOOOOOO HAPPY!!! i just PRAY that it continues and he does well with this new med! it has been an UP AND DOWN kinda thing! anyway, the worry never ends!! :) but no problem, i will handle it! who needs sleep anyway? i did it when alex was a baby and i nursed him, i can do it with matthew too, right?! 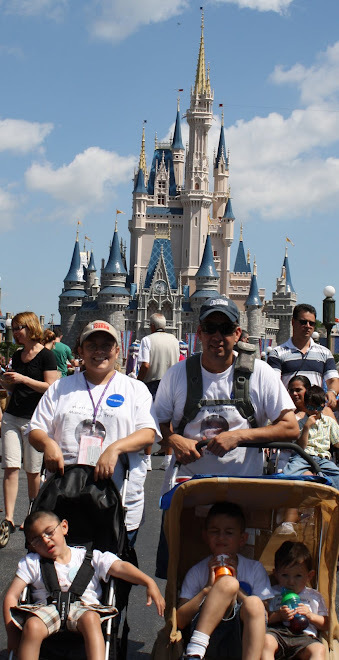 if you are wanting to hear all about our vacation, you should start by going down to JUNE 19TH when we left!!! there are some pics in there and another account of what happened with mr matthew and the airlife. there are also pics of the helicopter!! you can also leave a comment if you wish at any of the post...down at the bottom of each post you will see a area where it says COMMENTS and just click on that and it will give you a comment screen to post!! :) please let me know who you are!! we would LOVE to hear from you!!! we are sooo happy you came to visit! please stop by often! we are all about our families and our life soooooo......ENJOY!!! anyway, we are gearing up for alex birthday part!! YIPPPEEE! he will be FOUR years old!! AMAZING!! we went to rent the place yesterday! HOW FUN!! indoor event this time around .....he is getting sooooooo big! he always TALKING and it's funny, he picked up a new thing....."what's a ......." it could be a PANCAKE or WHATEVER, usually things he KNOWS what/who they are but he just always ASKS!! TOO CUTE! and he is ALWAYS singing! we are really going to start on our number and writing etc now. i am EXCITED!! and he is a little GENIUS on the computer! :) smarty boy! just a picture of matthes FIRST RIDE on his gator!! alex and cousin IAN are in front!!! well, we went to the neurologist appt on tuesday and basically all he did was change his meds...now my beautiful boy is soooooooo spaced out due to the INCREASE of seizure meds... he is now on 200 mg of ZONEGRAN up from 100 mg and they added KLONOPIN .5 mg pill at night and poor kids is ZONING!! this morning, he could BARELY sit! he was soooo tired that he kept falling over while sitting!!! he actually got up a little after 7:30am and went back for his nap at 10:45 am and didn't get up till after 2:30 pm!! so he is really tired from these drugs! tonight i will have to put him on his PULSE OX because last night he was REALLY junky sounding and i don't know if it is because his breathing is surpressed due to the drugs and he is just not moving things in his lungs....he doesn't have the best lungs to begin with sooooo, if this turns out to be the case, i will have to call the dr tomorrow to see hwat needs to be done! anyway, all in all....just praying my little matthew keeps healthy and NO MORE SEIZURES! i just don't know WHAT to think!!! matthew had done WONDERFUL after he got diagnosed with seizures back in 11/04 but now....since then, he had those big seizure in 04 then NOTHING thank GOD until 8/05 when he had that BIG hour long seizure...then only small LITTLE ones maybe 3 or so then 5/06 he had ANOTHER big 1 hour seizure and since then he had one 6/12 (15 mins), 6/21 (in MO for way over an hour), 7/2 (30-45 sec), 7/5 (not witness but had a WET shirt), & 7/9 (30-45 sec)....i just don't know WHAT is happening....i am starting to get concerned...they are ALL happening in sleep sooooo.....just something to think about now and to let the drs know.....i just PRAY that they resolve themselves and that they do no damage him in any way!!! matthew's quilt block finally got put in the CHD QUILT!! i am soooo excited and happy! they have done a BEAUTIFUL job with these quilt. 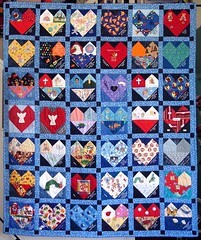 just a VERY SMALL reminder of how many people are born with CHD....this is quilt #37.....his is the square that is 3 rows DOWN and 5 across....i can only imagine HOW MANY quilts there would be if EVERYONE born with a CHD had a quilt square...i want to say that it is 1 in every 100 births are affected by a CHD... such a scary statistic....and most do NOT have a genetic link to them! last week, 2 more heart babies that i knew passed away.....one was not even a year old and the other was just shy of 2 years old.....i sit here and just think....wonder.....and GIVE THANKS to GOD that matthew is here with us....it could have EASILY been my family....my baby! i was passing by matthews little high chair and just these thoughts came to me of how it would FEEL if he was not here with us....never seeing him sit in his little high chair....never play with all his toys...never here him laugh or smile.....i couldn't stop the tears that came to me because it was SOOOOOOO REAL! i could FEEL such SADNESS and dispair and all he was doing was sleeping upstairs taking a nap!! i missed him SOOOOOOOO MUCH that i had to run upstairs and check on him to make sure he was breathing and just to reassure myself that he was THERE!!! how DEVESTATING it must be to lose a love one....a baby....my thoughts and prayers are with these 2 families and ALL families that have lost someone special.....i hope that everyone in the world realizes how EASILY things can change.....even a healthy person can be gone from one day to the next.....young....old....when GOD choses to take you home, it's TIME! anyway, i can only hug and love my family and PRAY for health and safetly......i just hope that everyone realizes how BLESSED they are to have their family/friends in their lives RIGHT NOW!! just making sure that everyone notices the PICUTERS from flickr (HEY BEKKI I FIGURED IT OUT!! :) they are from our VACATION!!! enjoy! anyway, it will be EARLY in the AM and james had to take off because they are going to sedate me and all! ohhhhh the JOY of it all is almost too much to bear! well, i changed my song today!! this is one of my FAVORITE songs! when someone tells me, "you are SO LUCKY" i ALWAYS respond that i am not LUCKY but i am "BLESSED"...GOD has blessed me with SOO MUCH in my life. 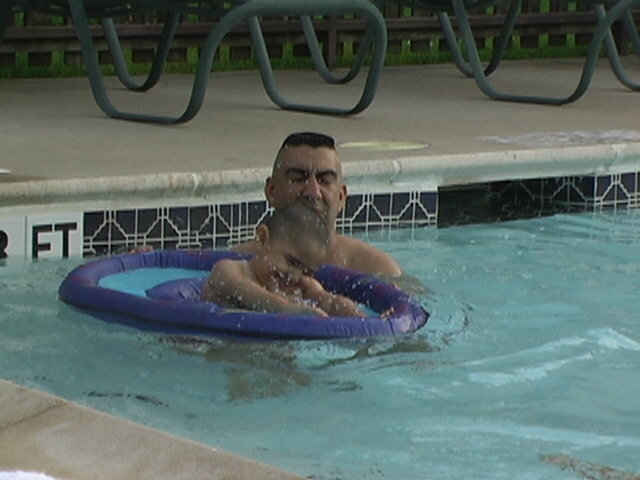 He has been there for me thru EVERYTHING that has happened in my life. i know i am BLESSED because HE is in my life and HE is the reason i am HERE TODAY.....my family, my friends....ALL OF IT is thru HIM.....THANK YOU GOD! SO, this song is by MARTINA MCBRIDE and it is called "BLESSED"....this song is how i feel...sooooooooooo BLESSED.....THANK YOU GOD for EVERYTHING good and bad in my life! HAPPY INDEPENDENCE DAY!! wow, james taught that to alex and he kept saying it ALL day long!! since things are messed up with some of the family, sadly, james and i decided we would celebrate here with just our little family! it was SOOOO NICE! james BBQ brisket, i made, beans, rice, salad, potatoe salad some chips and salsa and SWEET ICE TEA!!! MY FAV! anyway it was really nice!! then we just hung around. it rained so we didn't want to chance getting caught out there in this weather, so we just dropped some bbq to my mil and came home and put the boys to bed and james and i watched the SEA WORLD fireworks from our upstairs window! CLEAR SHOT! IT was really a nice display! i LOVE that about our house! we can see sea world clearly and we have a GREAT VIEW cause we are a slight rise! so we see all the way around!! anyway, HAPPY 4TH OF JULY EVERYONE! well, my hubby was put in the middle....there was some issues with another person in the family and they put hubby in the middle....he HATES when they do that! it is so unfair! he wasn't even THERE! YEP, today is SUNDAY and matthew was taking a snooze upstairs. i had been checking on him CONSTANLY (every 5 mins) running up and down the stairs. well, my mil was coming over and i had to run upstairs to change, well, as i was walking by his crib, i looked down and he was SEIZING AGAIN!! i told james, as i am running to the oxygen tank, HE IS SEIZING!! james is like, WHAT?!?!?!? so i start talking to matthew and am getting the oxygen set up. as i am putting it around his face and on his nose, i think i STARTLED him out of it!! he started to SCREAM when i put it in his nose and he felt the oxygen going in! and HE STOPPED!!! i know we caught it RIGHT when it started because there was only a LITTLE bit of wet spot on his jammies! THANK YOU GOD it stopped!!! it gaves a bit of a rush there but MAN that was CLOSE!